MailChimp is an email marketing campaign service that allows you to produce a range of beautiful mailers, newsletters and marketing materials for your church. Completing our integration with MailChimp enables you to synchronise a particular Tag (or set of Tags) in the Address Book with the mailing subscriber list(s) in your MailChimp account. You can choose between 'one-way' and 'two-way' sync - contacts in ChurchSuite that are part of a sync Tag will carry over to populate your mailing list in MailChimp (one-way) - or contacts in your mailing list that are not in your sync Tag are removed from the MailChimp mailing list so that the two lists always match (two-way). Contact details in MailChimp will automatically sync with the Address Book each night, ensuring that your mailing lists are always up-to-date in both platforms! The first thing that you will need to complete this integration is a MailChimp account for ChurchSuite to integrate with. If your church does not already use MailChimp you can sign up for free from their website. If your church does not already use Mailchimp (or if you do, but you don't intend to sync with an existing mailing list) then you will also need to to create a new mailing list for your tagged contacts to sync with. To do this, begin by accessing the Lists section within your MailChimp account dashboard. ...Enter the details for your new mailing list. Include a name for the List, as well a name and email address from which emails sent to that mailing list will be shown as originating from. Once you have entered all of the details for your new mailing list, click Save to complete the process. 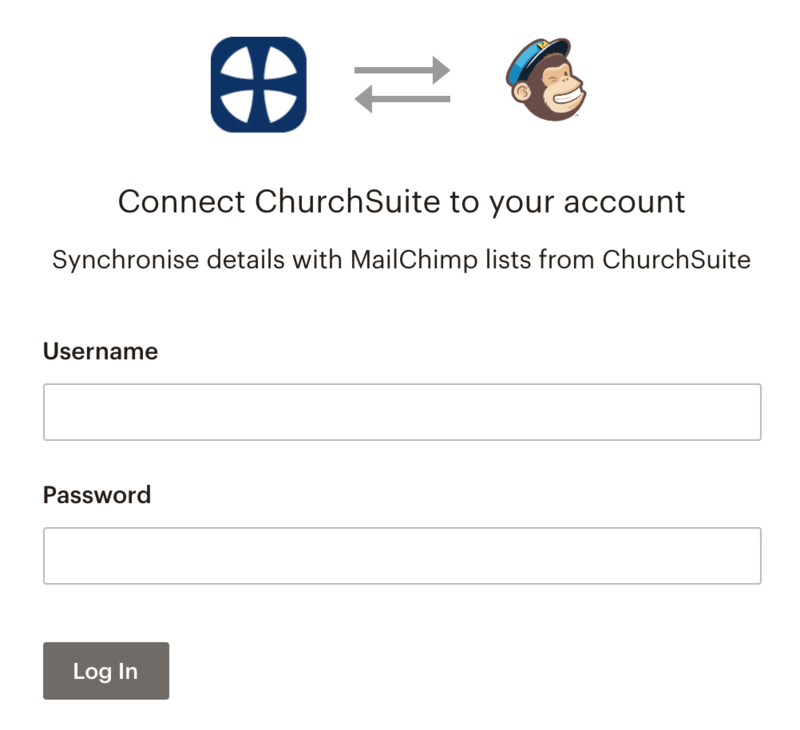 Having successfully created a MailChimp account for your church and having a mailing list to sync with (see above), log in to ChurchSuite and click through to the Administrator menu and select Integrations. There you will see a list of all of the integrations that are installed on your account. Click on the MailChimp integration. On the next screen you will see a progress bar partially filled yellow, indicating the integration progress. Read the instructions and the click Save and Proceed to continue. 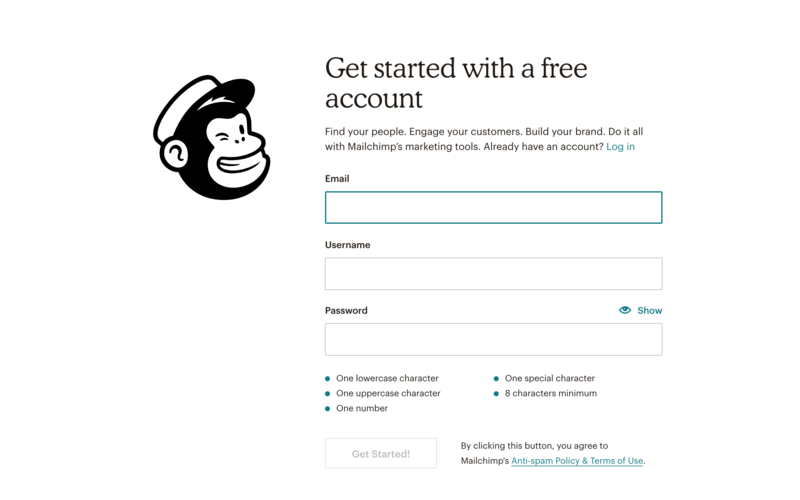 On the next screen enter the Username and Password for your MailChimp account and click Log In. You are now returned to the ChurchSuite MailChimp integration page. The progress bar is green, confirming the integration was completed successfully. Note that all of your MailChimp lists are now listed. Each time you add a new list within MailChimp, you will need to click the Reload lists button to see the new list in the MailChimp integration page. You can easily choose which fields are sent over to MailChimp from ChurchSuite during a "sync", giving you complete control over what data you share into MailChimp. To remove certain fields, simply change the Sync fields options. These optional fields can be helpful when you wish to segment a subscriber list within MailChimp. Alternatively you can restrict sharing of these personal information fields if you wish. By default each list ID will have --No auto-sync--. 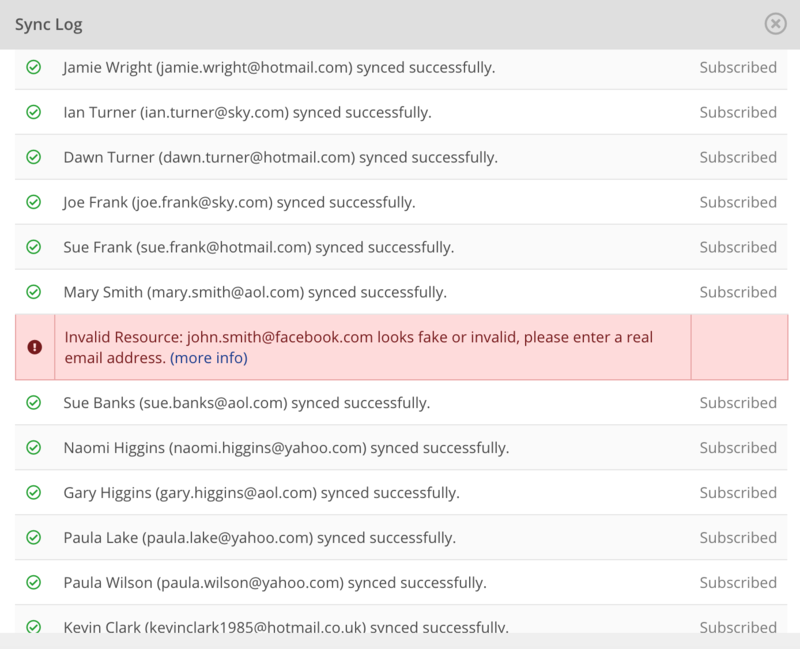 For each list in turn, select the Tag(s) that you want MailChimp to synchronise with from the Auto-Sync drop-down menu. For any lists that you don't wish to sync, leave them set as --No auto-sync--. Clicking the Sync button for any list (or the Sync All button) will now run the sync process for the first time. Existing Tag contacts not already in your mailing list will now be added to the mailing list as new subscribers. In future, any new/edited contacts that are in the Tag will automatically have their details synced and added/edited within that MailChimp mailing list. However contacts deleted from the Tag will not be removed from the MailChimp list. This is called a 'one way' sync. If you enable 2-way Sync, contacts that are in your MailChimp list but not in your Auto-Sync Tag will be removed from the MailChimp mailing list - essentially your Tag and mailing list will match. You may have existing subscribers in your MailChimp list that do not have a matching Address Book contact. Enabling "2-way Sync" would delete those unmatched subscribers from your MailChimp list, and only retain those contacts in your "Auto-Sync" Tag. This is often useful for auto-removing subscribers when an Address Book contact is archived or they opt out in ChurchSuite (perhaps using a Smart Tag to match opted-in subscribers), but care should be exercised to ensure subscriber data is not unintentionally deleted. Note that new Address Book contacts are never created by the MailChimp integration, and neither are Address Book contacts ever deleted by the integration. If you add a subscriber to a mailing list in MailChimp, with two-way sync enabled, that contact would be immediately deleted during the next sync. Therefore, with two-way sync you should add new subscribers to your Address Book Tag. If you use MailChimp to receive new subscribers to a mailing list, you should only use one-way sync, so that they are not removed from the MailChimp list when syncing with ChurchSuite. If a MailChimp subscriber unsubscribes, that record is retained against the MailChimp list, ensuring that former subscriber is excluded from the distribution list of future emails to that mailing list. "Unsubscribe" requests do not pull back through the integration to the communication options of people in ChurchSuite - there is no link between "Receive general email" in ChurchSuite and a subscriber's MailChimp opt in/out. In this regard, people may choose to opt out of your MailChimp list but stay opted in to your general ChurchSuite emails. Scenario 1. You add a person to your Address Book and add them to the Tag that's set to sync with a MailChimp list (assuming the person has consented to receiving your MailChimp communications!). With both 1-way and 2-way syncing enabled that person will be added to Mailchimp opted in to receive Mailchimp communications. Scenario 2. As per scenario 1, that person now opts-out of ChurchSuite communications by setting "Receive Emails = No", perhaps in My ChurchSuite, or they click an 'unsubscribe' link in a ChurchSuite email. That person will now cease to receive any ChurchSuite emails, including rota reminders; but as long as they remain tagged, they'll remain in your Mailchimp list for both 1-way and 2-way syncing and will continue to receive Mailchimp emails as they're still opted in to your MailChimp list. If you un-tag that person, 2-way syncing would remove the person from your MailChimp list. Scenario 3. A person not in your Address Book subscribed to your Mailchimp list - perhaps a link on your website. With 1-way syncing nothing happens in ChurchSuite, they're simply opted in to your Mailchimp subscriber list and will receive your Mailchimp emails only. With 2-way syncing they'll actually be deleted from the subscriber list on the next 2-way sync, as they don't exist in the Address Book. With 2-way syncing it's your Tag(s) that are considered the authoritative source and since they're not in the Address Book they'll be immediately removed from your MailChimp list on the next 2-way sync. They'll therefore receive no MailChimp emails. Clearly 2-way sync would not be suitable where you expect subscribers from outside your Address Book. 2-way sync is however appropriate for something like a Leader's subscriber list where only Leaders in the leader Tag are intended to receive Leader communications and therefore anyone not in the Leader tag should not be recipients of the MailChimp leader emails. 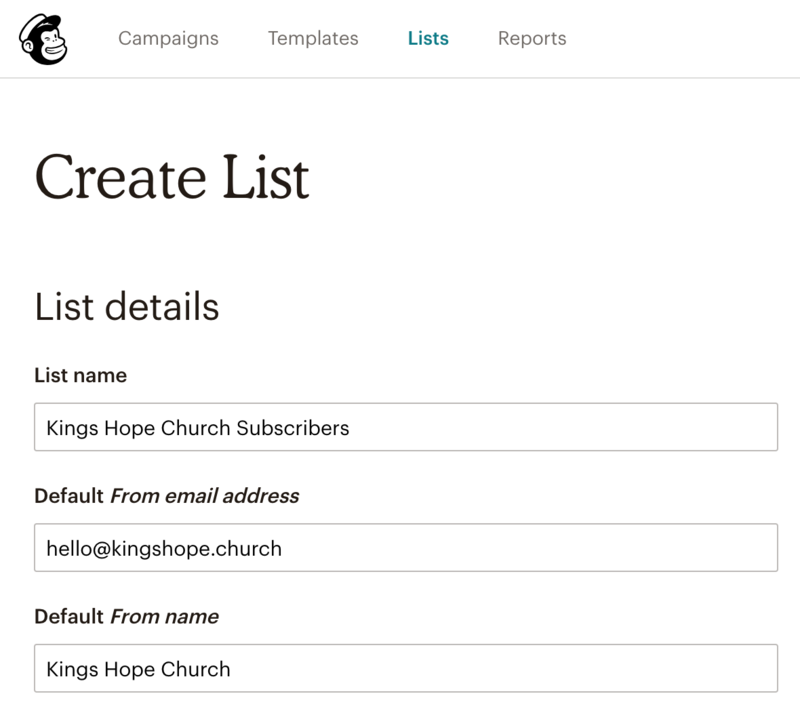 Note: Sometimes churches use MailChimp incorrectly by trying to create a single subscriber list and use 'segments' to manage the different groupings within the list. The problem then is that 'unsubscribe' is a complete unsubscribe from the list, not an unsubscribe from a segment. Therefore multiple lists for different purposes is the best approach, so that an unsubscribe from one list doesn't affect a subscription to other list e.g. someone might unsubscribe from your weekly e-news sheet mailing list, but can remain subscribed to your monthly church mission update emails. Scenario 4. A person is in the Address Book sync tag and in the MailChimp subscriber list. They click 'unsubscribe' in a MailChimp email you've sent, meaning they're unsubscribed from any future MailChimp emails to that list. Emails sent through ChurchSuite are still sent as long as the person leaves their "Receive Email? = Yes". 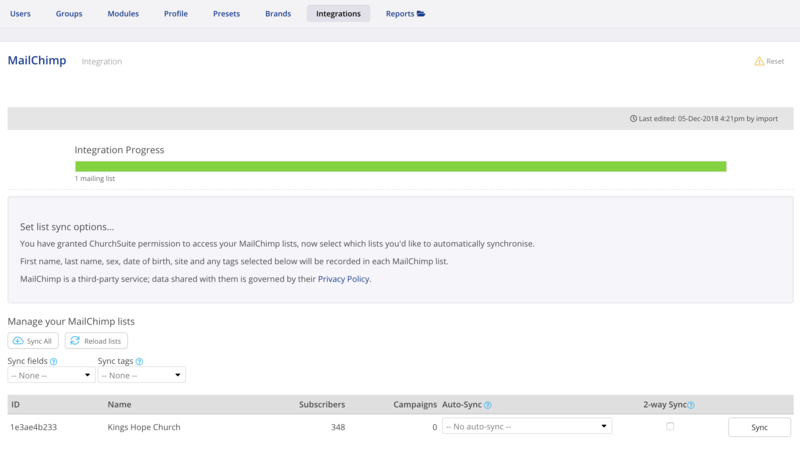 If 2-way syncing is enabled they won't be added back to the Mailchimp list - instead MailChimp will report an error in the integration sync logs during the next sync process. If they do wish to go back onto your MailChimp list, the church would need to log in to MailChimp and remove them from Mailchimp's unsubscribe list and then they'd be re-subscribed and tag-syncing would resume without error. Scenario 5. A person updates their email address in My ChurchSuite. If they're in a sync-tag, they'll be added to MailChimp as a new subscriber with that new email address. Their old MailChimp subscription will remain until such time as they unsubscribe from your MailChimp list. The exception would be with 2-way syncing, where their old subscription would be deleted and replaced by their new subscription. Scenario 6. A person updates their email address in MailChimp. No changes are made to the email address held in your ChurchSuite Address Book. With 1-way syncing they'll continue to be synced to their old MailChimp subscription and Mailchimp emails will go to both email addresses. With 2-way syncing they'll be immediately deleted from the Mailchimp list on the next sync for the same reason outlined in Scenario 4 - ChurchSuite's authoritative tag source will see the different email addresses as two different people and remove the new email address subscriber and keep the one that matches with the ChurchSuite Address Book. Scenario 7. If you're adding people to your MailChimp lists outside of ChurchSuite then it's through MailChimp that those lists are managed and not through ChurchSuite. From a data protection perspective, MailChimp consent is entirely different to ChurchSuite's consent, and each are managed separately. Churches, as data Controllers, remain responsible for communicating how personal data will be processed by the church (through their privacy notice) and whether that data will be shared with a third-party Processor, like MailChimp; and in doing so they will have sought appropriate consent at the point any personal data was submitted to them. In this regard ChurchSuite is not the Controller, the church is. ChurchSuite syncs with MailChimp once every 24 hours. Note that you can click Sync All, or Sync for a particular list, to force a synchronisation at any time. It's also possible to select Sync tags. Where Tags are enabled under the Sync fields, this option enables churches to choose which tags to sync over to their MailChimp list. These can then be used within MailChimp's list filtering to create subsets and groups within one master list; in other words, some of your ChurchSuite tags can be made visible within Mailchimp so that you can use them to create bespoke groupings within your master mailing list based on the contacts in your ChurchSuite tag groupings. With the integration completed you can navigate away from the page. Now, whenever you add new contacts to the Tag(s) that you've set to sync to your MailChimp mailing list, you can click the Sync Now button to have those carried over immediately, if you wish. Alternatively, ChurchSuite syncs with MailChimp each day (at approximately 4pm GMT and updates the logs at 6pm GMT), which will cause the details of the contacts on that mailing list to update automatically. Within the MailChimp integration we've included a helpful Recent Activity log, visible at the bottom of the page. Whenever you click to Sync a list (and at 4pm GMT each day for the daily auto-sync), a "Pending" note is logged, confirming that the sync is in progress. Depending on the size of your mailing list, syncing can take time. A "Finished" note is logged when the process has completed (and at 6pm GMT for the daily auto-sync). Once you click Sync or Sync All, you can safely navigate away from the Integration page if you wish; the sync process will continue in the background and add a "Finished" note to the activity log when it is completed. The "Finished" change log includes a summary of the operations completed and the success/errors. Clicking +More opens a detailed Sync Log (see below) so that you can investigate any issues. The Sync Log is sorted in alphabetical email address order (determined by MailChimp, and beyond our control to change the order). Against each subscriber you will see either Subscribed or Unsubscribed. Any errors are highlighted in red, along with MailChimp's error messages and an option to click through for more information about the issue. Note that MailChimp will not include subscribers with errors in the distribution list of any mailings sent through MailChimp.